A grimy unloved steam engine running under electric wires – the end of steam was approaching. Photo by JohnGreyTurner on Flickr. Like many nations in the West, Britain changed in the 1960s. Economically, socially and demographically, the country looked very different by the end of the decade to how it had looked at the start. Technological changes were a major part of this: television production, for instance, switched from black and white to colour. And on the railways, steam trains were phased out and replaced entirely, by late 1968, with diesel and electric trains. But railways in general, and steam locomotives in particular, have long attracted enthusiasts. By the end of the 1960s, not only had a national collection been established to preserve a selection of locomotives, but other engines had been purchased for preservation by wealthy individuals and groups of enthusiasts. Numerous closed branch lines had been or were being bought by enthusiasts and preserved, in order to run the saved locomotives. Most engines, however – tens of thousands of them – were sent to be scrapped. One scrap yard, in Barry, south Wales, didn’t get round to scrapping its engines, concentrating on other work and leaving them to rot in their yard. Most of these – nearly 300 – were eventually bought for restoration by enthusiasts. These three sources – the national collection, direct purchase from British Rail, and rescues from Barry – account for almost all the surviving steam locomotives in Britain today. The trouble was this: the process had been haphazard. Many types of locomotive, some of them important chapters in the history of railway engineering, were absent from the survivors – for many classes of engine, every single one of them had been cut up for scrap. Many people bitterly regretted their absence. In truth, the end of steam in Britain was not so neat as a total cut-off in 1968. London Transport kept using steam locomotives for its engineering trains into the 1970s; many industrial sites kept using them to move bulky freight around their sites into the 80s and even 90s. Meanwhile, many other countries continued using steam engines, and Britain continued manufacturing and exporting them, for narrow gauge railways at least. Manufacture of steam locomotives finally stopped in 1971, when Hunslet in Leeds completed its last steam engine for export. Just as the end of the steam “era” is a bit blurred, so is the beginning of “new build” steam. The first locomotives to be built for heritage railways in Britain are now quite old: narrow gauge lines like the Ravenglass and Eskdale in Cumbria and the Ffestiniog Railway in Wales began constructing their own locomotives, sometimes using remnants of older machines, in the 1960s and 70s. Working replicas of very early steam engines like Rocket were built as long ago as the 1930s. The move to build new, full size (standard gauge) locomotives – that could haul a decent train on a preserved line, or even the main line – took shape in the 1980s. As the Barry wrecks were being restored, the boundaries of what was possible seemed to recede. In particular, the restoration of the last British Rail express steam engine, 71000 Duke of Gloucester, pointed to what might be possible. So much of the locomotive had been damaged or cut up in the scrap yard, it was regarded as an impossible job; instead, it was restored to working order, and its performance considerably improved on what BR had extracted from it in the process. 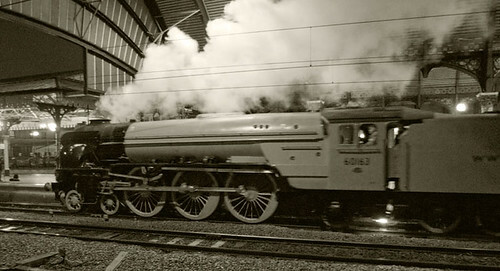 Tornado on its first ever mainline test run after completion in 2008 – a now legendary event in rail preservation. Photo by W Hannabuss on Flickr. This presented a new possibility to enthusiasts: if major components like new cylinder blocks could be fabricated for Duke of Gloucester, why couldn’t all the parts needed to make an entirely new locomotive be made, and some of the gaps in the remaining steam fleet be filled? The project to build a brand new A1 pacific – of the type that hauled express trains on the East Coast Main Line from after the Second World War until the 1960s – was established in 1990 (its name, Tornado, was inspired by the aircraft used prominently in the Gulf War). It took 18 years and 3 million pounds to bring it together – but Tornado is now a well-known performer on railways across Britain. Many more groups came into existence after 1990 (and one or two had even begun before): some dedicated to building new engines from scratch as with Tornado; others planning to use existing components, including from some Barry wrecks, to recreate lost classes. Progress on these projects is documented on this website. They are not without significance: the steam locomotives running on our main line in fifty years’ time, if there are any, will largely be the ones currently under construction. The remaining preserved locomotives are already very old, and increasingly facing the dilemma of how they can be kept running without replacing so many components that they could be argued not to be the original locomotives in any meaningful sense (a big debate in preservation). 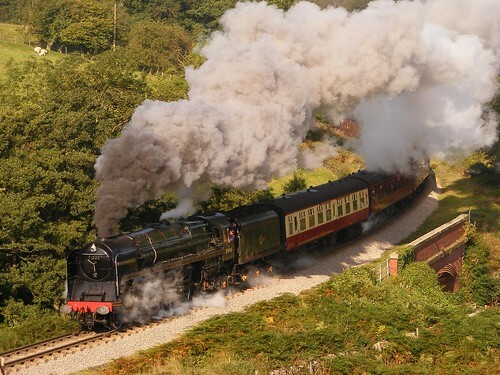 This is not to say there is a firm business case for new build steam locomotives – they are unlikely to be profitable, and like all aspects of rail preservation are built for no reason other than enthusiasm. Hi Richard – we define ‘new build’ for the purposes of this site as, “of a class not currently represented in the UK standard gauge steam fleet; and/or clearly built from scratch.” To be quite frank I can’t see how Thornbury Castle fits either of those criteria, but if you feel it does then please make your case and we’ll consider it! Sorry, I also took New build as “rebuild”, using new & old bits. Please delete if it crosses the boundary. Great site though, yours that is. Has anyone thought about building the GWR Cathredrals class? As far as I am aware there are drawings of the locomotive that was never built. Not only that it will fill a gap in Great Western history as the first prototype was meant to be built at Swindon works in 1946 but never came into existence because of the government still wanting freight locomotives. I know we have the GWR Counties (4-6-0 and 4-4-2), the Saint and the Grange being built but I feel that the Cathedrals class would be the UK’s most powerful steam locomotive. Hi Gerard – if you look through this site you will find various figures giving the cost of building particular locomotives. 2007 Prince of Wales, for instance, is expected to cost £5 million. Operating a regular service with steam trains is possible only on preserved railway lines at present, but see our article from February containing information about the first UK ‘Plandampf’ service. No new build locomotives are available for purchase ‘out of the box’, although preserved engines come up for sale from time to time. I recommend you read through some articles on this site for an idea of what it’s all about. Thank you for the information. The locomotive would be transported to the Caribbean at the appropriate time. I am not sure how the energy storage is supposed to work, bit 3000 bar is the working pressure in the fuel rail in common rail diesel engines for large trucks, so the pressure is handled routinely in industry. You can only use steel for the containment, other metals not having a well-defined fatigue threshold would fail after a number of pressure cycles. It is in fact elasticity of the fuel rail that provides the accumulator function. Doing this with a large volume of water (which, unlike diesel oil, might induce stress corrosion cracking) would not be easy, but I think possible. As for new build locos, I would like to see the decapod, variously named Big Bertha or Big Emma. No practical use except as a rarely needed banker, but distinct and different. I would also like to see a properly developed Leader, incorporating every efficiency improvement that we now know, and maybe a water tube boiler for rapid startup and shutdown, and increased safety..
Well what can I say? The concept is held together by the very nature of the green Grid. It will work for water at 2,000 – 3,000 bar, in my Turbine, will act like steam. I can say this as this is. old water accumulatetor technology, but at a Quantum. Keep in working pressure. As the accumulatetors are linked together in parallel, with a on line pump, working at the same pressure, the piston accumulatetors work as if they were cells in a lead acid battery. That is to. say. that they only have to discharge a small percentage of there charge. The energy in each accumulatetor, must reflect the amount of green energy used to change them in the first. place. As the concept is a closed positive Dynamic feed back loop. The dynamic, must be the tractive effort put into the rolling road, from which we extract our, Electrical energy to. be. used to keep the loop at it’s working pressure, with any left over power being put back into the local micro Grid. Note this is just lots and lots of Steel cylinders, part made from high grade. coal? Water not steam, Richard? But water is incompressible, so applying 3000 bar (44,000lbf/in-2) to it results in no storage of energy, so how would it work? What temperature are you considering? If above 375°C,that’s potentially seriously ultra-supercritical. An intersting area to consider,but materials requirements can become very exotic. It’s O.K. I am on the “Case” Yes I have the I.P.R. on a turbine that uses the 2nd law of thermodynamics to keep steam water hot in a closed loop. ‘Duke of Gloucester’ and ‘Tornado’ have show what is possible, but the steam locomotive in the UK is about to enter troubled times. 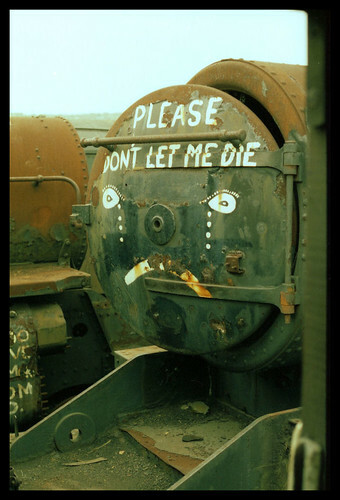 Many engines are restored from Barry scrapyard condition, and were in a very poor condition, by which I mean much worse than anything that would be tolerated on a preserved railway running today under a light railway order, when BR withdrew them. You can get away with bringing a bag of nails into steamable condition and running at 25 mph up and down a preserved branch line for a while. but eventually the riding and general condition of the frames and springs will deteriorate and the loco will need a major rebuildling if it is not to knock itself to bits every time it moves. I do not mean in any way to demean the enormous amount of work put in to rescue these engines from Barry condition by dedicated volunteers often working in less than ideal conditions, but the awful truth is that, underneath the polish and shining paintwork, some are still in fundamentally Barry condition. When the engines were acquired from Dai Woodham, the main worries in the minds of those putting cash and effort into them were things like ‘how hard will it be to get a boiler certificate’ or ‘what state are the cylinders or anything else that might need expensive casting in’ (as the people involved in 2857’s restoration discovered; BR had been running the loco like that in it’s final service days! ), and, especially, ‘how are we ever going to pay for it all’, and frames, axle boxes, hornblocks, and springs were by and large stripped down, cleaned up as much as possible, re-assembled, and put back on the locos. Not until the loco was steamed and run was it apparent if these components were any good or not, and that 25mph speed limit covered a lot of sins. Sooner or later these will require complete replacement with new items, and the question will arise as to whether it is cheaper and quicker to build a completely new ‘replica’ loco like Tornado as opposed to struggling on with an engine which was at or approaching the end of it’s working life in the 1960s and has now put in a fair few miles since. Nor are the more recently built BR standards immune to the problem, despite having had shorter, and in some cases very much shorter, working lives. 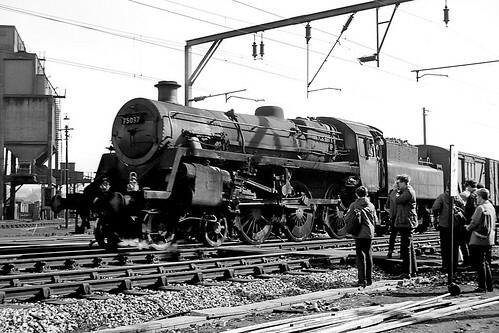 They were built at a time of austerity and the quality of steel used in the vital structural components was clearly inferior, and many were hammered to death in their brief service (I include the rebuilt ‘Merchant Navies’ in that comment); a walk along the platform at Cardiff (Bute Road) in the 90s when the ‘Barry 10’ were stored there showed that the 28xx and 5101 were in far better condition that the 9F, with an LMS 8F in not a bad state at all apart from the boiler cladding! ‘New build’ locos such as the Patriot, 82045, ‘County of Glamorgan’ and so on use Barry components, and as such may find themselves in a compromised situation sooner than their operators expect, perhaps in only 20 or 30 years. Boilers are not as much a problem, as they have to be maintained to the highest standard in order to be ticketed, and were in any case built with phenomenal strength in the first place, but the running parts of the engines may be their ultimate downfall. Around 2050, what is the situation going to be like? I suspect that there will be a number of completely new built brand new engines, using modern materials, roller bearings, and maybe oil-firing and electronic control so that they can be single manned. Some may be ‘replicas’, improved versions of traditional designs using exterior components such as funnels, domes, cabs, boiler cladding, and so on from the originals, but some may well be completely new designs, which will be interesting. Replicas of 19th century classics such as ‘Jenny Lind’ or a ‘Crompton’ could be built, along with rakes of 4 or 6 wheeled replica carriages with air disc brakes and automatic centrally locking doors to go with them. If restoring Duke of Gloucester or newbuilding Tornado were not enough of a challenge, perhaps someone might have a crack at making the ‘Leader’ work.. The coaching stock may well also be in a parlous condition before 2050. The bulk of it is BR mk1, and most of those vehicles were altered in the 60s and 70s to have the steps removed as a safety measure owing to the presence of 25kv electric cables, and the hole where they were cut off plated over. This has introduced a long term corrosion problem to the body framework of these vehicles, and their condition is slowly deteriorating. Older coaches are already beginning to show their age in terms of running; I was aboard a Bullied brake 3rd on the Bluebell a couple of years ago which actually frightened my a bit in the way it lurched and staggered over pointwork! Along with the Raven A8, can I have a Rhymney Railway L class 2-4-2 outside framed saddle tank, please! Thanks John – I’m sure some people will view what you say as contentious, but I enjoyed reading it! I will admit. What you are saying scares me. I am now concerned some of the locomotive restorations may not have been thorough, and with the decline of coal, I am worried that many if not all British steam locos in service today will soon enough never be able to run again, including even new-build engines like Tornado one day never running again. But I wonder if all the worn parts of a locomotive were replaced, would the engine run like new? 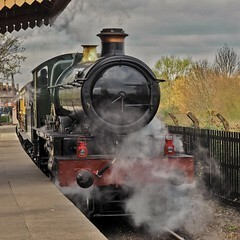 I have heard of engines not performing as well due to age even after restoration and it makes me worried one day all mainline steam will vanish completely. If an engine could be made to run as good as completely new, including perhaps full repair or replacement of the frames & moving parts, it would bring me great hope that steam will last for many generations to come. To be honest it seems that the preservation movement needs to adapt to whatever comes its way. It’s managed to make main line steam last this long by doing just that, and the same will apply to the private steam lines. Maybe biocoal will be the answer of the future, maybe something else, hard to say at this point but should coal become increasingly short in supply, expensive, or come with some sort of heavy green tax from a future government, then the subject may be raised in the future. As for being able to restore the frames and moving parts, I’m an engine cleaner at Bridgnorth on the Severn Valley Railway, and trust me, the work that these guys do in the workshops, it is unbelievable what they can achieve. Sure it takes a great deal of time and money, but it needs innovative thinking. Maybe new builds might be necessary for even current classes in steam now, if they come to the point of being too long in the tooth for operations. Perhaps the answer might instead be to continue with the “trigger’s broom” method in continually replacing the parts of the engine, ultimately meaning nothing of the original is left, but the engine is still essentially the same, and in running order. As for mainline steam, it’s hard to say, because ultimately the national network will became faster and more crowded, but the A1 project are a very dynamic bunch, what with getting Tornado to run London to Edinburgh for with Top Gear, AND do the ton for the first time since the 60s. Certainly this is something we didn’t see in the early/mid 2000s when there was much more of a despondency for mainline AND heritage railway steam. Mainline steam does have support of network rail, and needs to be sold as something for everyone, not just steam buffs and nostalgia fans, and it needs to evolve with the situation on the ground, and persuade the rail network people that there’s something in it for them as well. One of the biggest concerns being enthusiasts being idiots running all over the fast running lines like with Scotsman recently. To be fair, preservation was an impossible mountain to climb in the first place, but it was climbed. Most of the restoration projects seemed like pipe dreams, yet they were achieved in the end. Nobody could’ve looked at most of these lines and thought to themselves that one day they’d be where they are now. Certainly with the Severn Valley, there seems to be an influx of more young guys. When in previous years, the average age of engine cleaners was 45, it’s now guys in their late teens or their twenties like me. It’s not just the volunteers, but I’ve noticed many more punters who are young people at Bridgnorth, not just the older generations there for the nostalgia.